This informative guide is for an architecture firm of any size to effectively develop itself, and then market and promote its work, based on its expertise and value to clients. The author guides the reader to address issues of firm identity, including an understanding of how to create the market positioning desired, using a series of hierarchical steps and decisions. 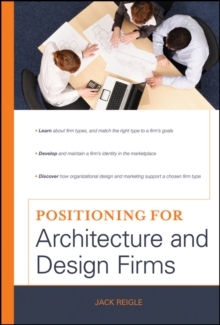 The reader will learn from approximately twelve case studies of firm positioning that will be written from original research to provide helpful reinforcement of material.